International Relations and Islam: Diverse Perspectives presents the idea of finding a middle way or common ground of understanding between two bodies of knowledge conceived from two different hemispheres of the world; namely, International Relations (IR), a social science discipline conceived in the UK and the US (the West), and Islam or Islamic Studies which was conceived in the Arab world and developed in Iran, Pakistan, Turkey, Malaysia, Indonesia and many non-Arab countries. The book is divided into two main sections; the first being general perspectives from different backgrounds or cases concerning Islam. The second part specifically examines Turkey, offering various perspectives on the significance of this country and its democratic experience. The contributions included in this volume range from discussions on the Islamic veil and its associated stereotypes to an article on Islamic feminism. Other subjects discussed include the issues of Muslim integration, Turkey’s international relations, and Islam’s relationship with democracy, in addition to a biographical representation of the current Minister of Foreign Affairs of Turkey, Ahmet Davutoğlu, detailing his scholarship and its impact on Turkey’s foreign policy. 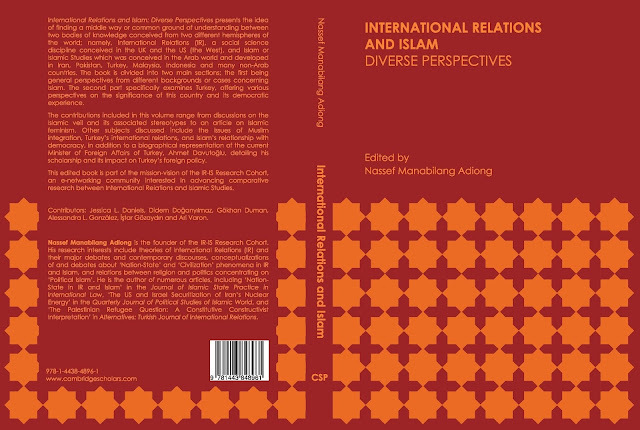 This edited book is part of the mission-vision of the IR-IS Research Cohort, an e-networking community interested in advancing comparative research between International Relations and Islamic Studies. Contributors: Jessica L. Daniels, Didem Doğanyılmaz, Gökhan Duman, Alessandra L. González, İştar Gözaydın and Ari Varon. E-flyer will be updated by August 2013 as soon as the book will be available.